If you're trying to involve your kids in a fitness routine, consider introducing them to yoga and Pilates. Children are naturally flexible, which can help them achieve success easily with these types of exercise. 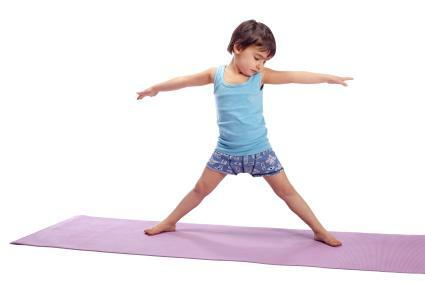 Yoga and Pilates can also help spur a child's imagination while he or she engages in each pose. You can adapt many beginner and basic yoga poses so kids can do them. Start with any of these, then move on to other poses or find a mommy-and-me or children's yoga class in your area. Mountain pose is the most basic of yoga poses. Combined with Crescent pose, this is a great way for kids to get grounded and learn some basic stretching. Have your child stand up straight and tall with his feet planted firmly on the ground, while you stand in front of him in a mirroring pose. Raise your arms up above your head as you breathe in and have your child do the same. Stretch your spines up as tall as you can while you root down through your feet. Touch your hands together above your heads, then bend your upper body to the right. Be sure to keep your hips straight and bend only from the waist while your feet are firmly on the ground. Straighten up and bend in the other direction. To make this pose more fun for small kids, try singing, "The Bear Went Over the Mountain" as you stand up straight and bend. This is another simple pose that is good for kids to do. Sit with your child on the ground. Encourage her to sit up straight and tall while she brings the soles of her feet together and lets her knees fall out to the sides. Have her grasp her ankles while she sits up straight and tall. Flapping your knees up and down like butterfly wings. Pretending to put peanut butter on the sole of one foot and jelly on the other. Then, stick the soles of your feet together to make a "sandwich". Rock from side to side in this position while singing, "Humpty Dumpty". When Humpty falls, both of you can fall over onto your sides. Tree pose is a little more challenging, but will help strengthen your child's core, while working on his balance. Stand up straight and tall across from your child. Have your child root down through both feet evenly, then shift his balance onto one foot. Raise the other foot up and rest it on the calf or thigh - do not place your foot against your knee or have your child do so; this can cause injury. Place your hands in prayer position, or spread your arms out like branches and balance. Keep your body tall and straight and lift up through your standing leg to help balance. 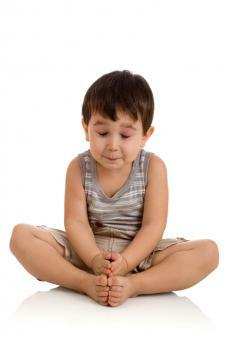 Make this pose fun by starting down on the ground in Child's pose. Pretend to be small seeds that gradually grow tall until you are both tall trees with branches swaying in the wind. Back bends can be a lot of fun for children who are usually super flexible. Bow is a good beginner back bend that can be done safely on the floor. Lay down on your stomachs with your legs stretched behind you and your elbows bent with your forearms flat on the floor. Raise your shoulders up around your ears like a turtle and encourage your child to do the same. Bend your knees so your feet come up off the floor. Keeping your shoulders up around your ears, reach back with first one hand, then the other for your feet. Push your feet into your hands to pull your chest off the floor into the shape of a bow. When doing this pose with a small child, try wriggling like snakes on the floor first to practice getting shoulders up around the ears while laying on the ground. Five Pointed Star is a simple pose that is the beginning of more strength building postures like Horse. 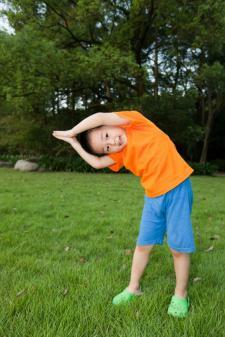 Kids can practice stretching out into the star before moving on to forward bends or other poses. Stand facing your child with your legs spread wide. Have your child spread her legs out wide as well. Stand up straight and tall and extend your arms out to the sides. Count your points, starting with your head, then shaking out one arm or leg at a time. Sing, "Twinkle, Twinkle Little Star" while you rock back and forth from foot to foot. Practice jumping from Five Pointed Star into Horse pose, yelling, "Gotcha!" as you land in Horse. You can now do a "Gotcha" dance by wiggling your hips from side to side. Pilates moves may be more challenging for kids at first. To help make them more fun while strengthening the core and improving balance, try some moves that involve a balance ball. This move will help build core and leg strength while improving balance. Have your child lay on her back with her arms by her sides, knees bent and feet flat on the floor. Place a balance ball just in front of her feet and hold it steady while she places her feet on top of the ball one by one. Encourage her to lift her spine up off of the floor while placing her weight on the ball and her shoulders. She can also roll the ball down from her feet to beneath her knees. Hold the position, then roll back to the floor. Plank is a great core strengthener that is a lot more fun for kids when done with the ball. Have your child get into a high push up position. Roll the ball back behind her feet. Help her lift her feet up on top of the ball one by one. From here, have her experiment with lowering into a low push up position or rolling backwards on the ball so her stomach is on the ball, then coming forward again. Remember to help support her pelvis as she is getting stronger. Kids can perform the seated twist can on a chair or bench. Doing it on a ball helps strengthen the core and improve balance, while adding some fun. Hold the ball steady while your child sits on it with his feet flat on the floor. Have him place his hands behind his head, or hold his arms out to the sides. Encourage your child to keep his bottom steady on the ball while he twists his torso from side to side. Yoga and Pilates moves for kids are so popular now, there are many resources for fun home instruction. Itsy Bitsy Yoga: Poses to Help Your Baby Sleep Longer, Digest Better and Grow Stronger - This book is the perfect introduction to Mommy and Me yoga for babies and toddlers. A Toddler's First Yoga Book - Lots of colorful illustrations to encourage your toddler to give these poses a try. The Kids' Yoga Deck: 50 Poses and Games - This set helps encourage kids to get creative through yoga poses and moving their bodies. Stott Pilates: Fitness Fun - Pilates for Kids - An instructional DVD for kids to learn Pilates moves creatively. Classical Pilates for Kids and Young Adults - An instructional DVD with different phases for kids of all ages to learn to do Pilates. The best children's exercises are the ones that can be preformed with adults. This helps encourage proper form, interest and and a continuation of the fun. Try doing some yoga and pilates moves together and see where your fitness journey takes you.